The Mahlke Chronicles: Friends are forever. Lets rewind time about a decade. Now meet Angie, a younger, more carefree version of myself. Still in college, single, no kids, working part time at a grocery store deli. Now meet Ann, a fellow employee at the grocery store. Angie and Ann like to spend a significant amount of time frequenting college bars, like most young, carefree 20-somethings do. Now meet Tara, girlfriend to the cousin of my coworker. She also likes to patronize college bars. Check out the date on this photo: 2003. 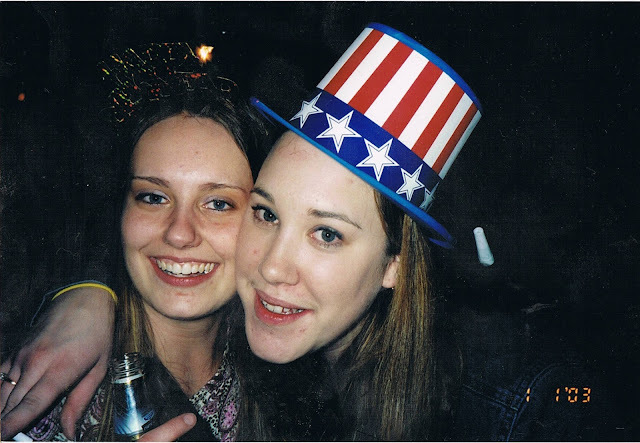 Apparently, Ann and I rang in 2003 in style. Now fast forward almost a decade, but not quite. We are in the distant past when the young, carefree girls are settling down and spending their time somewhere other than bars; thus, spending less time socializing with each other. This older but still relatively carefree Angie starts a new job at a phone company where Tara happens to work. They start socializing again. Angie, Ann and Tara become pregnant around the same time, leading them down the same life path at the same time. Emails soliciting support regarding sleepless nights, breast feeding, colic, you name it, instigate this new friendship, bonding these once carefree girls together. Now we are back to the present day, a few more babies between them, and these girls are more than friends. They're family. That was the condensed version of how three friends morphed into surrogate sisters. We email each other daily about such mundane things most ordinary people would yawn and tune out, but if I go a few days without finding out what Tara ate for supper or what time Ann went to bed, I start going through friend withdrawal. We might not be able to see each other on a weekly basis, yet we know almost every little detail of each others lives. I value their friendship so much that I wanted to do something special for them. Celebrating Tara's 32nd birthday with some jello shots. Back in November when I was trying to think of what to get Ann for her birthday I discovered the most perfect thing, but it was scheduled in February. Since Tara's birthday is in January, I decided I should celebrate both of their days simultaneously and take the opportunity to turn it into a big mysterious surprise. I had to approve the date with them so they could block that date on their calendars, and I have been teasing them with the secret ever since. Isn't the suspense just killing you? Saturday we ate dinner at a Cajun restaurant, where I gave them each a basket full of goodies. One item was wrapped in paper with a handwritten instruction to open last. This gift would reveal the big surprise. Both girls squealed when they opened it and discovered what they each had suspected: Beauty and the Beast tickets. After eating our meal (and a quick pit stop at my van for a pumping session, since one of us is always either pregnant or nursing) we took our seats for the play. 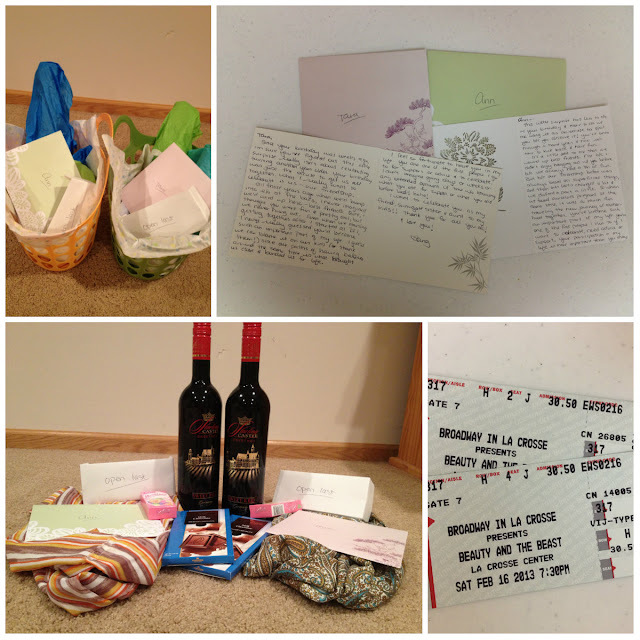 Goodies include card with a sappy, heartfelt notes, wine, chocolate, candy, handmade scarves and tickets to Beauty and the Beast. A few hours later we were back home in our houses with our sleeping families, and I couldn't help but to feel grateful for such great people in my life. Living so far away from my family, it has been a necessity for me to carve out a close-knit group of friends that act as my family away from home. Thank you, Ann and Tara. I love you! At Beauty and the Beast.